About Parliament | History | State symbols | Chartist checkbox | Did you know? Queensland's Parliament is the only State Parliament with one House, the Legislative Assembly. In 1922, the Theodore Labor Government abolished the Legislative Council, making Queensland's Parliament the first unicameral Parliament in Australia. There are currently 89 Members of the Legislative Assembly (MLAs), each from a single electoral division. Members are elected for a term of up to three years, using the optional preferential voting system. Voting in Queensland State elections is compulsory for all citizens aged 18 years or over who have been living in the State for a month or more. Queensland was originally part of the Colony of New South Wales and was known as the Moreton Bay District. It has its origins in a penal colony established at Redcliffe in 1824. The people of the Moreton Bay District agitated for a number of years to gain self-rule. This was achieved in 1859 when Queensland became a separate colony. Queensland's first Parliament was a form of responsible government but it was not a democratically elected parliament unlike the parliaments of other Australian colonies at this time. The Constitution Act 1869 passed by the Queensland Parliament brought responsible government to Queensland. After 1905, all men and women aged 21 and over who were British or became naturalised as Queenslanders were allowed to vote. The current voting rights came into effect in 1973. Queensland has no official colours, but state sporting teams traditionally wear maroon. The shield depicted on the Queensland Coat of Arms was given to the colony in 1893 by Queen Victoria. The supporters, a red deer and a brolga, were assigned in 1977 by Queen Elizabeth II. The Latin motto 'Audax et Fidelis' is translated as 'Bold, Aye, and Faithful Too'. The Queensland flag became official in 1876. It consists of the blue ensign with the Union Flag in the corner and the State Badge. The current design came into use in 1953, when the crown on the badge was changed to St Edward's Crown. The State Badge shows a Maltese cross with St Edward's Crown in the centre on a white disc. The style of the crown in the middle of the cross is altered in keeping with the style of crown chosen by the King or Queen of England. The design was officially changed in 1954 following Queen Elizabeth II's choice of the St Edward's Crown for her coronation in 1953. 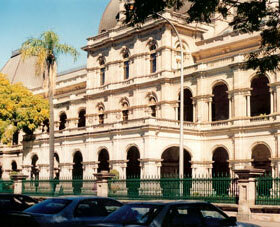 Queensland's Parliament House is on the corner of George Street and Alice Street in Brisbane. It was opened in 1868 and is considered to be one of the finest buildings in Queensland. The original design of Parliament House included a porte cochere (carriage porch). However, because of a lack of money, this was not built until changes were carried out in 1979–82. In 1959, the Cooktown orchid was made the State Floral Emblem of Queensland. The koala was made the State Animal Emblem of Queensland in 1971. The brolga was made the State Bird Emblem of Queensland in 1986. The sapphire was made the State Gemstone Emblem of Queensland in 1985. Equal electorates A 10% variance from the quota is tolerated, but the largest (in area) five districts in the state receive rural weightage. Voting rights for Indigenous Australians Indigenous people were granted the right to vote for the State Parliament in 1965. Queensland did not send delegates to the constitutional conventions of 1897–98. Many Queenslanders, particularly those from Brisbane, thought federation would bring too much competition from New South Wales businesses.